Little Jack- Like Blinks 70 #07 67636 23.00лв. Little Jack- Like Blinks 70 #08 67643 23.00лв. Little Jack- Like Blinks 70 #06 67629 23.00лв. Little Jack- Like Blinks 70 #05 67612 23.00лв. Little Jack- Like Blinks 70 #04 67605 23.00лв. Little Jack- Like Blinks 70 #02 67582 23.00лв. Little Jack- Like Blinks 70 #03 67599 23.00лв. Little Jack- Like Blinks 70 #01 67575 23.00лв. The collection of these baits capture the Boyle. Their slim body form of real baits removes the vigilance of the targets. Their "flashing roll action" is attributed to their low center of gravity and asymmetrical curve body. Their bodies are fortified by the wires that go through them. 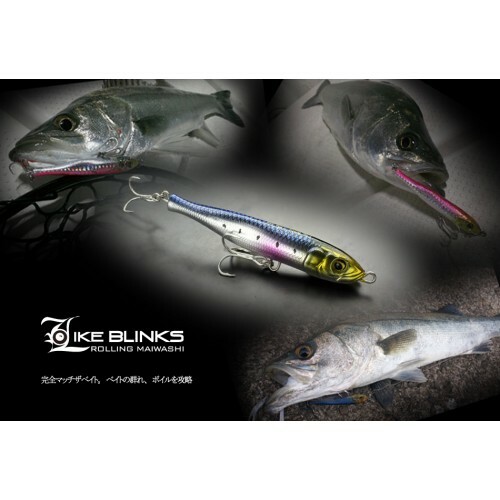 "Like Blinks" are the models that pursue reliable hooking. They undergo "bo-vibe", flashing fall IL and rise, stalking that is slower than metal jigs. Being committed to their body shape in real symmetry and to their weights of low center-of-gravity, they achieve reliable rolling action, although slowly. True to their product name, they tempt their targets with their blinking-like flashing. In addition, the forms of "Like Blinks" enact most realistically the dying baits that have strayed from their pack. Compared to metal jigs, they are more likely to be ignored in the field and they have a higher rate of biting from large targets that are highly vigilant. Their appeal lies in the way they fall.They do so, vibrating compactly. Their moderate speed in falling is also their attraction.